Sense status of environment monitoring equipment, analyze and respond appropriately in real-time. Application senses status of environment via multiple types of sensors. If an issue is detected it notifies appropriate personnel and – if situation is critical – dynamically locates and assigns the most appropriate assistance based on location, training, and equipment. VANTIQ applications have been applied to a variety of environment related situations. For example, VANTIQ takes readings from the air, land and water and combines vastly different data streams, in real-time, to report on and react to critical situations. VANTIQ is also pulling relevant information from the internet by mining data from other environment monitoring sources including weather data. Sensor data is enriched, in real-time, with this additional information. VANTIQ has created applications that analyze ground/soil conditions to optimize farming and water monitoring authorities are using VANTIQ to ensure water quality targets are achieved in major rivers via cloud-connected sensors. Electric motors are a key component in countless industries. The break-down of a motor causes down time of production. Using a VANTIQ application, an engineering company currently working with VANTIQ quickly developed a remote monitoring platform, enabling the users to monitor the status and the historical performance of the motor and achieving break-down tracking and prediction. 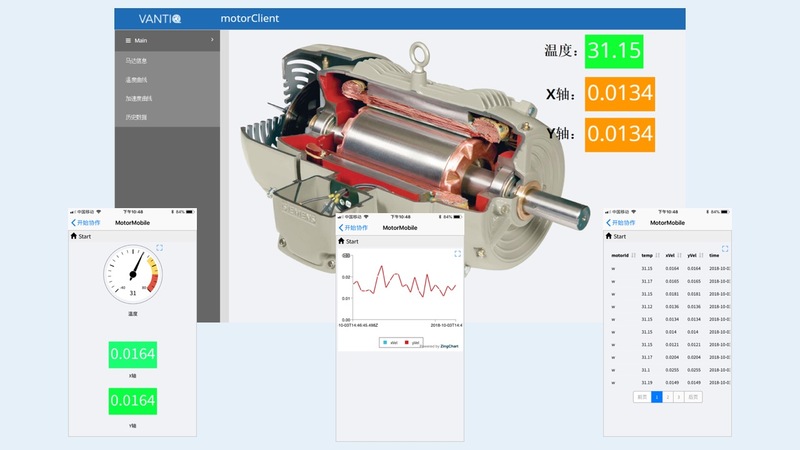 As a supplier of sensors and equipment, this engineering company can develop the enterprise-oriented platform in a few days with Vantiq, and integrate AI modules for predictive maintenance. They also can efficiently achieve the transformation from a hardware supplier to IIoT service provider with very low cost. This VANTIQ application increases their competitive advantages, expanding the new business model, and improves their customer service.